You get little hint of what you will see inside from an outside view of the butterfly facility, just a peek at some of the tallest vegetation, and perhaps of a few butterflies resting high on the screening. The flight cage is actually outdoors and the tropical nature of the place is not revealed by the surroundings of northern Florida. 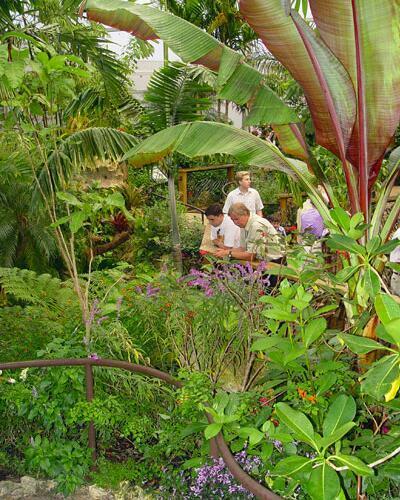 Inside, you are surrounded by lush tropical plants, waterfalls and streams, and hundreds upon hundreds of butterflies representing 50-75 different species. They flit all about you, bask on the plants everywhere, and sometimes even on you. It is a magical place. A moth lover like me isn't even bothered by the fact that only one species of moth is present -- the giant Atlas Moth. But many moths are among thousands of species displayed indoors. I usually avoid promoting things on my webpages, but the McGuire Center is (or should be) of special interest to anyone who loves insects. If you ever have the opportunity to visit the place it will almost certainly be an enjoyable experience and time well spent. 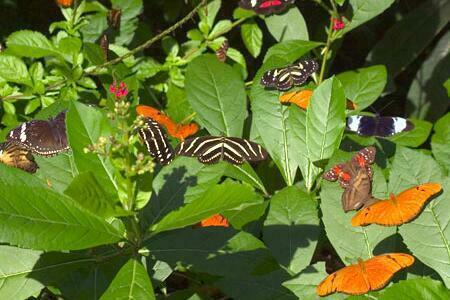 There is a modest fee for admittance to the Butterfly RainForest. 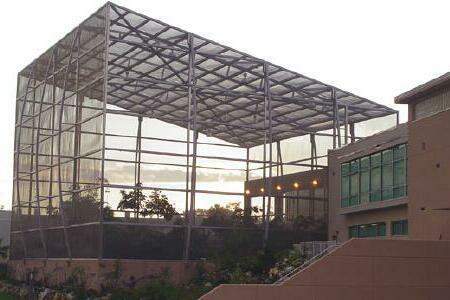 All the exhibits, and the rest of the Florida Museum of Natural History, of which this is a part, is free. I had learned about the Butterfly RainForest through the journal of the Southern Lepidopterist's Society and had been looking forward to visiting the place. I had another reason for wanting to visit the Butterfly RainForest. I wanted to meet personally and chat with Alan Chin-Lee (who managed the facility) and Hannah Nendick-Mason. Both led educational tours of the RainForest and its laboratory where the thousands of pupae obtained from many countries hatch or eclose to become adult butterflies to be released into the flight area. They are as delightful to talk to as they are knowledgeable about their butterflies. Previously I had met both through email exchanges, and both have contributed numerous photographs for the Living Moths Plates that appear on the Moth Photographers Group website. These three photographs of the McGuire Center are yet another of Alan's contributions. Alan also introduced us to Andrei Sourakov, one of several research entomologists and a curator of the enormous research collection housed elsewhere in McGuire Center. Andrei showed us one of the "compactor rooms" where thousands of trays holding moths and butterflies are efficiently stored in the minimum possible space. They are still in the process of bringing together all of the specimens previously housed in different areas of Florida, and in adding newly acquired collections. Ultimately, this research collection of moths and butterflies will exceed all others in the world with the exception of the British Museum of Natural History. Be sure to read about the Wall of Wings in the butterfly and moth exhibit area. This immense exhibit, with its several large-screen audio-visual displays, is alone worth a visit to the place. And it is beautiful beyond words.